There has been very little comment on the FIA's ratification of the engine rules for 2008 to 2017. Either this is because everyone is still trying to cope with the blatant favoritism of the ruling on the Renault case (which would make the FIA's timing perfect, slipping in the new rules while no-one was watching) or because the rules are so opposed to the ethos of F1 that it is difficult to know where to start. I suspect the latter, since it was the problem that confronted me as soon as I read PitPass's article on the subject. The ten year freeze on engines is well known now and plenty has been said on the subject before. But the accompanying regulations are a testament to the FIA's preference for interference in team matters rather than tackling a problem at its roots. Instead of limiting the influence of aerodynamics by simple means such as extending the flat bottom to the nose of the car or by banning winglets and bargeboards, the FIA want to specify how many wind tunnels can be used, for how long, with what models and under what conditions. Since the justification for these measures is cost saving, should not the FIA consider the fact that many of the teams have been using two wind tunnels for some time and the money has already been spent therefore? And how are the regulations to be policed? Will every team have to accept inspectors into its facilities to ensure that none of the specifications are exceeded at any time? Anything less is so open to abuse that it is laughable. BMW might be grinning at this point, having opted for a super computer rather than an extra wind tunnel, but they will be deflated when they get to the later regulations that limit the amount of time, effort and personnel that can be invested in CFD computer systems. And that is not all. On the way are more limits to be imposed on rig testing, design and manufacture, suspension and brakes, hydraulics, bodywork, weight distribution (! ), circuit testing and number of personnel at races. Max Mosley has said that he wants a spec formula and these regulations are yet another step on the road to such an anathema to the ethos of the sport. Are none of the FIA delegates sufficiently in touch with F1 to understand that this is destroying the sport's essential foundation? There is a reason for there being two championships, a driver's and a constructor's; they reflect the fact that F1 is a competition between drivers and between designers. With regulations as restrictive as the FIA have happily ratified, the designers' aspect of the competition becomes reduced to almost zero. And I am reduced to meaningless spluttering in my indignation at the idiocy of these regulations. They have been formulated by people with no love for the sport, no understanding of its roots, no vision for the future. It does not matter that the rules are completely unenforceable, that they insist the teams become mere manufacturers of pre-set components, that creativity and innovation is stifled; what has become clear is that the FIA is unable to govern the sport in a sane and responsible way. Suggestions and advice have been available to the delegates in abundance but they have ignored it all and opted instead for the most unworkable solutions possible to imagine. If we think F1 has too many legal tussles at the moment, we have not seen anything yet. Once these regulations come into force, the opportunities for cheating will become so extensive that barely a race will pass without some new accusation flying from one team to another. There will have to be armies of inspectors looking over the engineers' shoulders at every moment to see that they do not exceed the specifications. There'll be no more overtime for engineers, although the snoop industry should enter a golden age of jobs for everyone. Why men like Ron Dennis and Frank Williams would even wish to continue in a sport headed down such a road, I do not know. They have known what it was to turn out a car that could beat everything else, to introduce innovation that gave advantage for a time (until copied by everyone else), to have given drivers the opportunity to compete at the highest level of motor sport. How can they bear to watch the sport being destroyed by those who understand nothing of it? Maybe it really is time for a breakaway series to be started. A great post Clive, your points come across well and it is very hard to disagree. It does seem that those who are in control of the sport are slowly reducing it pathetic exercise of car building (with the instructions included and followed). I think a breakaway series is very unlikely to happen - each time it is mentioned by Williams, Dennis et al it just seems like hot air. It's a shame really, because Formula One needs to return to what it does best; designing, building and racing cars. F1 is not about following the instructions that come with the FIA-standard Lego set. Excellent post, as usual. The real challenge in the current system would be, if it's possible to get rid of Miserable Mosely. can the FIA then be open to discussion with the teams about what they see as best for the sport and possibly reverse some of his worst edicts. It just boggles the mind that a group of well funded individuals want to compete in a way that has a history and tradition, and there is one single individual who wants to toss all of that into the garbage and remake it in his image. It's like a distinguished gentleman who has the money to dress well and still has the vitality to move forward in his endeavors who is forced to get a bad face-lift and wear hip-hoppers clothes. Mosely's decrees are unbecoming of a gentleman. I realized after posting my comment, that Mosely is an avid snow-boarder, so my comment is closer to the mark than I initially thought! Max needs to be sent out of the sport and to his grave never to return, sooner rather than later, else he will ensure that the sport goes to its grave never to return. Surely with the continued victimization of Mclaren and inconsistent ruling on cases that were never meant to be taken up by the FIA at all, the opposing voices from all quarters are rising. Already Bernie has spoken out about the FIA. Now tempting the media's right of opinion with a law suit, i can see the writing for Max is on the wall. Is it only me or do all of you to feel the same? surely a matter of when than if in my view. It seems we are all in agreement. Everything Max has said is utterly uncontrollable. Of course this will allow him to continue to manipulate F1 by ignoring some complaints and persecuting others. The engine freeze effectively means that if someone develops an advance engine component in February it is legal for 10 years. If someone else develops it in April it will be illegal for ten years. This may seem unlikely but had this come into place thirty years ago Reanult could legally have run turbos for 10 years but everyone else would be banned from running turbos. Utterly, utterly insane. So long as the FIA is allowed to run F1 you are going to have to put up wit Balestre/Moseley types. It is worse now because Max got rid of FISA and therefore the FIA president can do what he likes. The best chance of a breakaway series is if Bernie sets one up. My hope is that there are things going on behind the scenes that we know nothing about - things that might result in the teams putting on a united front against the FIA. Unfortunately, it does not look good on that score, with Ferrari and McLaren in a state of virtual war, Renault licking Max's boots (how short is their memory) and Williams proving intransigent over customer cars. Perhaps the sport must descend into even more disrepute before the team owners realize that there are some things more important than their vested interests of the moment. I understand the frustration, believe it. I'd love nothing more than to walk into the FIA offices and explain in incoherent fan terms how they are actually beating this sport to a bloody pulp, but, a break away series is just not the way to go. In the mid-late '90's my race day preference was CART, latterly, ChampCar because, honestly, the on track action blew everything else away. The split with the IRL and manufacturers splintering everywhere and in 2007, I can't actually be bothered to watch either series. They both have merits, but neither is up to the standards I loved and remember well. I thought at the time that ChampCar would have to win it but, nobody has. They are both diminished to an extreme. I can't wish that on F1 to any extent. I'm not sure there is a way out of the current mess the FIA have put the sport into...which they have. Controversy may be good, but an obvious lack of consistent judgement and direction is disastrous and unfortunately that is all we've seen from the FIA this year. It may submerge again for a few months and maybe that's what they are banking on, but once the racing starts again, who knows what happens next? Another spying issue, another team uses banned tech, more drivers, or teams decide to open up about the sport itself. There is just no clear directive at the FIA. There has always been caprice and apparent favouritism but, I don't recall a season that has appeared so out of control and inconsistent as this. I agree completely regarding the IRL/Champ Car split, Verasaki, but that is the kind of thing that happens when desperation sets in. Everyone tells me that there is no chance of the FIA being restructured and it seems that they are right. I see no sign of any fight back from the teams, at least. So what do we have to look forward to? A sport handicapped by regulation until it becomes unwatchable? Anything is better than that, even two series that are not as great as the one that preceded them. This is a bit off topic but I can't imagine Clive will object. The FIA are suing the Sunday Times for a column Martin Brundle wrote saying that it looked like there was a witch hunt against McLaren. Max being the sensitive soul he is took umbrage and the WMSC gave him permission to sue. Yes Max is going to sue the Sunday Times. i.e. he is going to go into court against Rupert Murdoch. This is too good an opportunity for us to miss. My view is that Max will get slaughtered in a court case and the resultant humilation will either force him to resign or to be pushed out. The link at the bottom of this post is Martin's latest column in which he comments on being sued and the repercussions he expects to suffer. There is a comments facility. Please leave a comment in support of Martin and encourage anyone you can to post similar comments. I would love to see Martin walk into a court room with a pile of comments in agreement with his position. At the very least this will encourage anyone planning to challenge Max. This may be the only chance we get to make a meaningful change to the direction of the sport. I know there are a lot of petitions around but there chance of success is limited. Here we have a chance of producing evidence that can be used against Max in a court over which he has no control. There are no topics in my blog, Steven - we talk about whatever we feel like talking about! That way, we get around to just about everything! And I wholeheartedly agree with the idea of giving Martin reams of comments in support of his view of the FIA. We have complained about their high-handed ways for years and here is a chance to help someone who is being attacked merely because he wrote about their apparent bias and unfairness. Even were it not true, Martin is entitled to his opinion and should not have to suffer the loss of his accredited press status for printing it. That is just blackmailing to keep people quiet. Max may at last have gone too far. Something needs to be pointed out here. The WMSC has only approved the filing of a case, but no case has been filed yet. This could just be a scare tactic. But do remember, the FIA is made up of many lawyers and is headed by a barrister. They know the courts well enough. Back to the topics of the last five years. This is getting really ridicilous. How many times have we said that the FIA is destroying F1? How many times have we said that the manufacturers should react sooner or later? But what happens??? Nothing!! At least three of four times every winter, the FIA goes on to impose another set of rules that tells the engineers they know nothing about F1. And what they know and what gives them their salary is soon to become of no use in F1. This sport is soon to become nothing more than a rolling circus displaying the worlds most expensive commercial signs. I can't imagine it ever getting back to it's roots, it will sooner begin to rot from the inside and out. Finally just becoming dust, and vanish forever. How can there be any interest in running a team in this sport any more? There's nothing in it. No hurdles to overcome more than those imposed by FIA when they sue a driver or a team for breaking one of their five million rules. All true, Journeyer, and I do not share the confidence of many commentators that the FIA would lose such a case. It is very difficult to prove that the FIA's actions have been motivated by a desire to penalize a particular competitor more than another, even when it is quite apparent to an outside observer. How does one quantify such a thing? But I think there may be hope if the case is lodged and proceeded with. It will be an opportunity for previous decisions by the FIA to be examined in a public forum where there can be no fudging and avoidance of the point. 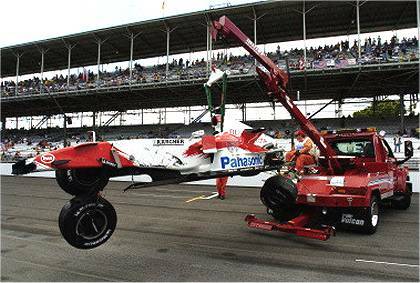 The FIA is composed of lawyers, yes, but even lawyers make tactical errors sometimes. I hear your frustration and anger at the situation in F1, Björn, and can only say that I share it. The future of the sport looks grim indeed unless someone in power starts to listen to the grassroots mighty soon.